Players of Street Fighter III 3rd Strike: Fight for the Future and Devil May Cry 3 probably know Daigo Ikeno. 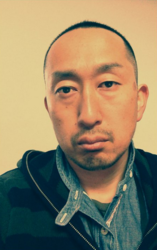 The artist, also known by his real name Ikeno METAKA, joined Capcom in 1994 as a chara-designer and illustrator. Among his major works, you must have heard of Capcom VS SNK 2, Onimusha, or Onimusha 2. More recently he's been in charge of art direction on Dragon's Dogma. He has also been in charge of Street Fighter IV as Art Director.